Quantum Computing – The wavy world. Recovery Plan- A financial marketing perspective. The Internet is a world wide web of interconnected computer networks which comprises of millions of privately and publicly owned, academic, business, and government owned networks which have local to global scope. These networks are linked by copper wires, fiber-optic cables, wireless connections, and other technologies. Commercialization of the internet network started in the mid 1990s, and countless applications in virtually every aspect of modern human life have evolved since then. 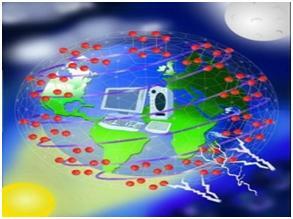 As internet is touching every aspect of the human life, we are more interested in the future of internet. What would be the role of internet in the future world, let’s say after 10 years i.e. 2020. Recently a survey was conducted by the PEW internet and American life project to predict the implications of the internet on society in coming times and how internet will be evolved? The survey focused on the responses from the key personnel in internet industry, analysts and technocrats. I have summarised the survey outcomes so as to understand the future of internet. The major trends that could evolve in internet usage impacting our society are discussed here. Global network deployed: By 2020, world-wide internet network interoperability will be achieved, which would allow unrestricted flow of data, verification of credentials and billing; mobile wireless communications will be a low cost commodity available to everyone. In future, convergence of more and more services on mobile will happen. English as the global language: Internet Networked communications will play a major role to combine the world into a single political, social and economic entity where people can connect each other and everywhere to have audio – visual exchanges using internet. English can thus become the primary global language displacing few of the regional languages. Growing Technology dependence is a problem: In 2020, our growing dependence on the technology and day by day reducing human control as an interface with increasing usage of artificial intelligence which would cut direct human input so completely out of few key activities such as electronic surveillance, security systems that technology out of our control could generate threat of dangers and dependencies that could not be identified until it would be impossible to reverse them. Personal privacy at stake: The other impact that internet could have in 2020 is that with growing usage of internet and it’s availability at cheaper costs, privacy of not only the celebrities but the common man would be affected. In fact, we will be connected to the outside world all the time. But if we look at the bigger picture, it will be good as both the pros and cons would be highlighted easily and the society will be more aware. Internet opens doors to success: In 2020, Internet will open the door to success. As rightly predicted by Thomas Friedman in his book The World is Flat, in year 2008, the internet can make it possible for individuals to collaborate and compete globally. The free flow of information will completely blur the national boundaries. The new boundaries that could evolve which will be groupings based on corporate culture with varied geographical boundaries with flat organizations bounded together by the global networks. Terror risks looms: Increased connectivity and information will led few people to stay away from the global networks to live in peace but few others could utilize the efficacy of these networks for terror attacks as they might not be happy with the way the technology is shaping the world. So, a new type of terrorist segment could arise in the years to come. These are the major trends that could evolve in the 3rd stage of internet evolution and we can clearly see how our lives will be changed within few years. The technology will accelerate the change process so fast, that would be, beyond imagination. Semantic web will have a drastic impact on this change cycle in the coming years. We should look forward to evolving convergence technologies to make this world a better place to live in.